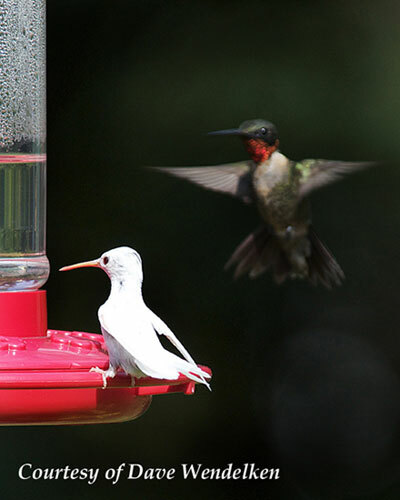 The albino hummingbird should not to be mistaken for the more common white leucistic hummingbird, albinos are incredibly rare. Photos from this page show the classic pink eyes of any albino creature. A rare, mind-bending sight, this is a must-see for every serious fan of these ever-fascinating creatures. Could a hummingbird be even more remarkable! It could if it were an albino. A pure white hummingbird does exist in nature. 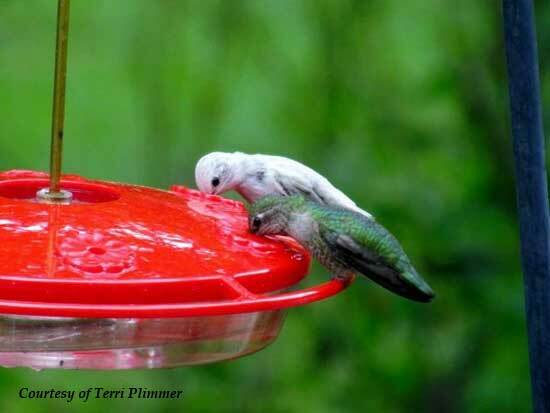 It should not be confused with a similar hummingbird, the leucistic hummingbird. To help us make this distinction, let's start with the definition of "albino". 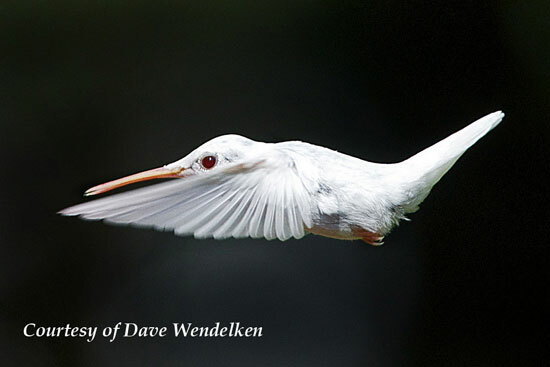 An Albino Hummingbird has a rare genetic mutation that prevents the formation of any dark pigment. This recessive gene only shows up if the bird inherits the gene from both parents. 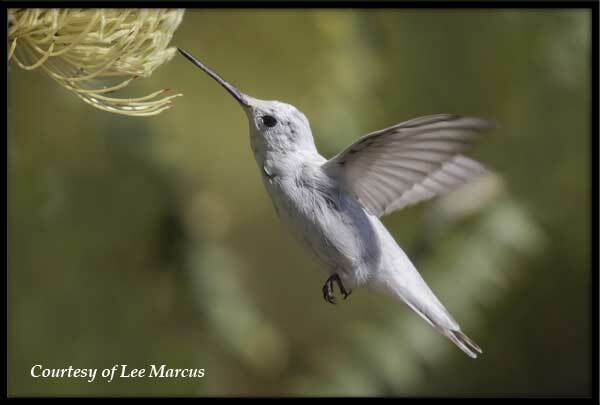 On the other hand, most hummingbirds with abnormal plumages are leucistic. 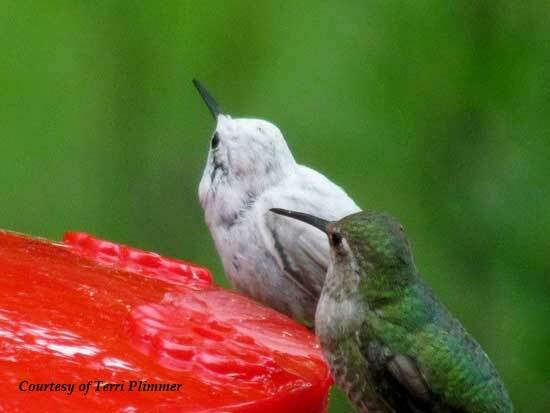 These hummingbirds often lack some but not all dark pigment. Commonly, this may be due to diet deficiencies during feather development, aging or disease. 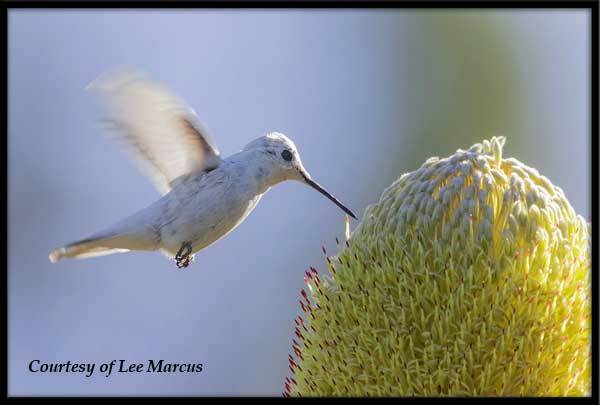 A Leucistic Hummingbird generally has white, off-white, or tan plumage. Their eyes, beak, and feet are black showing normal pigments on these body parts. An albino is always pure white. The eyes, feet, and bill of a true albino are pinkish. This indicates it has no pigment (melanin) at all. Best Friends Enjoying Dinner Together! 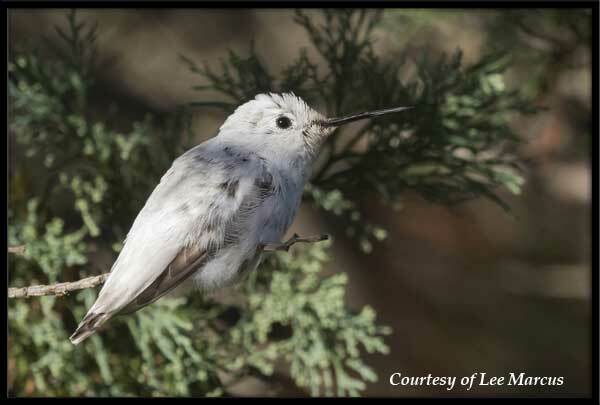 Notice that these photos of the Leucistic hummingbirds show the normal color of the eyes, beak and feet. As you might guess, very few true albinos have ever been seen. Although some have been banded, none have ever been captured the following year. Color alone can possibly be a problem. Perhaps the white feathers are much too visible to predators. Possibly these feathers are brittle and break more easily. 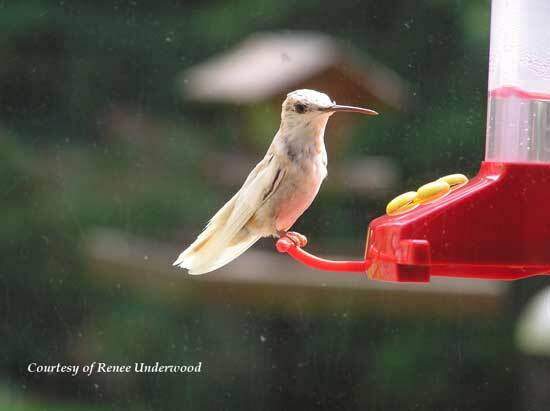 There might even be some genetic factors that weaken the bird before the natural life cycle of reproduction can allow for more albino hummingbirds to be born at all. Formal scientific study has not been done at this time. Hummingbirds are truly a wonder of nature. Everything about hummingbirds is amazing. It isn’t just the miniature size that fascinates us. Perhaps, the spectacle beauty of hummingbirds with iridescent feathers that reflect light at certain angles does capture our imagination. The interesting behavior of these birds is practically unrivaled. With a metabolism that enables them to eat twice their body weight in nectar each day, these creatures expend energy almost beyond our comprehension. A hummingbird beats it wings at a rate of 60 times per minute. 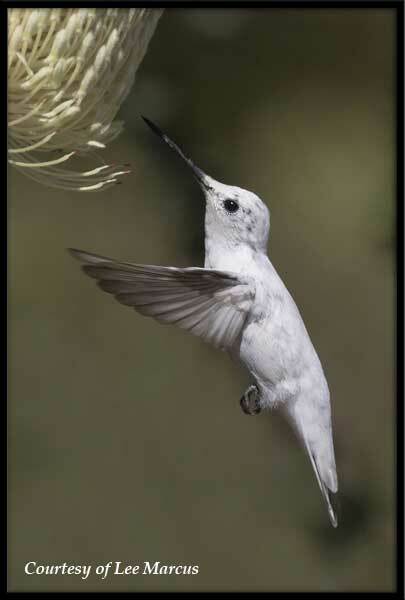 Only a hummingbird can fly forwards, backwards, upside down and hover in place. Learn more about Hummingbird Flight. A mother hummingbird builds her nest about the size of a walnut shell using spider webs. Learn more about the Hummingbird Nest. It has the largest brain of any bird comparable to its size and will return to the same feeders every year. 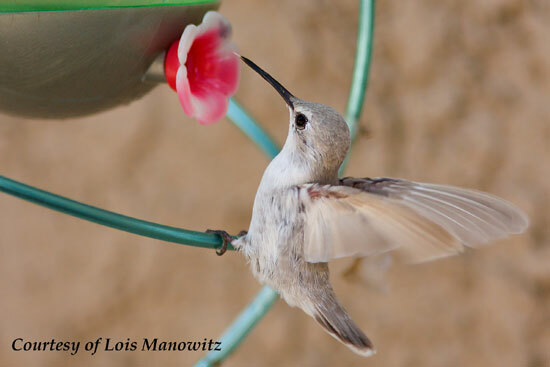 Learn How to Attract Hummingbirds. For now, a mystery about this marvelous hummingbird will remain....... adding to the many reasons we continue to be intrigued by its charm.